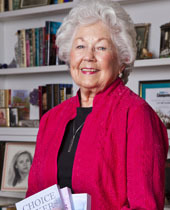 In 2008, at the age of 79, Eleanor Cocreham successfully realized a dream with the publication of her first book, a romance novel titled Choice Makers. Buoyed by strong sales and critical acclaim, Eleanor met growing demand with Risk Takers, a sequel published later that year. She rounded out the popular series with Heart Breakers, which was published in 2010. Now 83, Eleanor – and her fans – are looking forward to the publication of her fourth novel, a “paranormal time travel” saga based on the devastating 1893 hurricane in Grand Isle. Much like the strong-willed heroines of her books, Eleanor exemplifies the virtues of determination and perseverance. She wrote her first novel in 1987, followed by the first sting of rejection from the highly competitive publishing industry. That was when she started on a 21-year-long journey of learning the art of writing. She subjected her manuscripts to grueling workshops and learned the business and technical side of publishing. She worked hard to learn the art of character development, committing to a point of view and conducting research. She was rejected more times than she can count, but she developed the confidence and know-how to succeed. In a world that promotes overnight fame and next-day fizzle, Eleanor reminds us that hard work and perseverance are the only sure way to success. She has developed the thick skin and confidence necessary to thrive as a writer, and she’s even gained three critique partners, with whom she swaps her writing on a regular basis. It’s a level of success she never could have achieved at a younger age because, as Eleanor says, getting older has made her more willing to take the type of chances that are critical to being the hero in your own story. Eleanor Cocreham… Peoples Health Champion.